Oosh (or shoes) is a common word around our house. 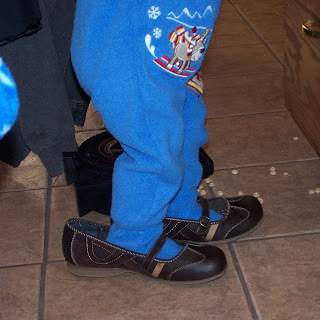 The boys LOVE to wear shoes, preferrably shoes that are too big for them. 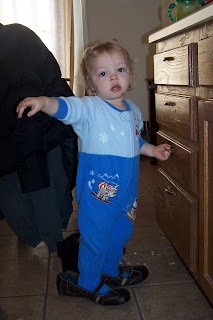 I have a pair of boots that Hayden loves (you'll see pictures below). When he sees them he says,"boots, boots" and then is happy when I give them to him. Carson loves shoes too. They also love socks. I'm not sure what it is about putting things on their feet, but it sure does keep them occupied for a while. Here are some pictures of my boys in their "oosh." 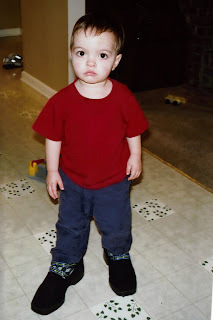 Here is Carson with Gooodmommy's shoes on. He got into both the dressy shoes and the tennis shoes. 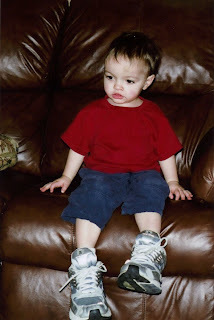 Here is Hayden in a pair of my shoes. These were a favorite for both boys for quite a while. Somehow I didn't get a picture of Carson in them. Finally, the boots. I though the diaper was especially cute. 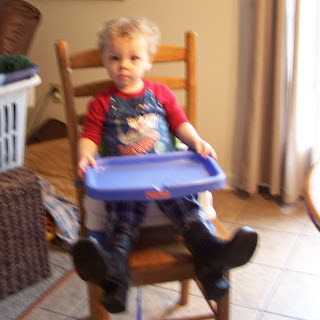 Hayden enjoyed these boots so much that he had to eat his breakfast AND lunch in them one day. You'll also see Carson in the refrigerator. The boys LOVE to help get things out of the refrigerator - and love to sit in it. Oh my, that is adorable. 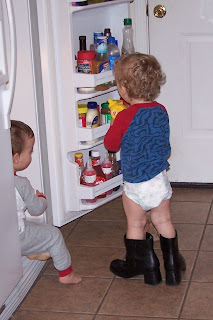 The boots, diaper, fridge combo....that is precious. Isn't if funny the things they attach to. Looking forward to more pics and posts, the boys are adorable!